A SWOT Analysis is a popular strategic planning tool used to evaluate the Strengths, Weaknesses, Opportunities, and Threats involved in any businesses. Using mind map allows you to collect and structure a lot of information involved in SWOT Analysis as well as identify the relationships between different pieces of information. ConceptDraw SWOT Analysis solution combines the visual advantages of ConceptDraw MINDMAP and presentation capabilities of ConceptDraw DIAGRAM to provide a complete work solution. The SWOT/TOWS results from ConceptDraw can be easily exported to Microsoft PowerPoint, Microsoft Visio, Adobe PDF, and many electronic file formats. You can export your SWOT mind map into a MS Word document, which makes using SWOT mind map easier if you need to collaborate it with other people. From ConceptDraw MINDMAP inputs choose the Management category and run the SWOT Analysis template. ConceptDraw products across any platform, meaning you never have to worry about compatibility again. ConceptDraw MINDMAP allows you to make SWOT analysis on PC or macOS operating systems. ConceptDraw DIAGRAM v12 diagramming and vector drawing software offers you the Matrices Solution from the Marketing Area with extensive drawing tools for creating the Porter's Value Chain diagrams. ConceptDraw Word Exchange solution gives you the ability to export mind maps to MS Word. 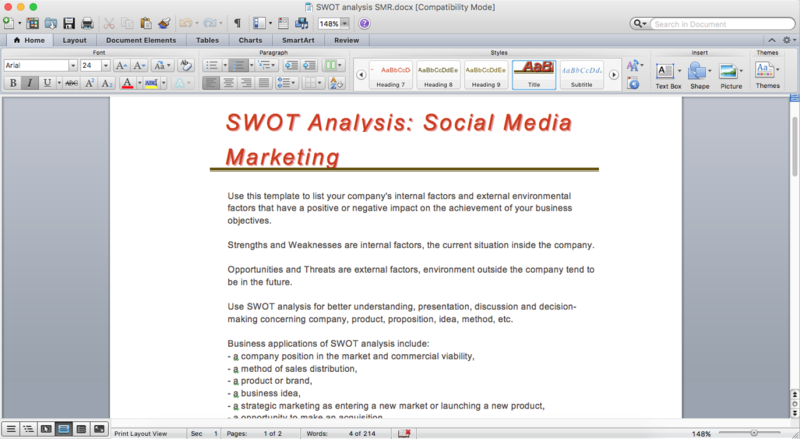 It also allows stylizing the resulting document by using a custom MS Word template. Everyone wants to be efficient. To succeed, try Mind Maps for Business - SWOT Analysis and enjoy the result. But be careful: it can be addictive! 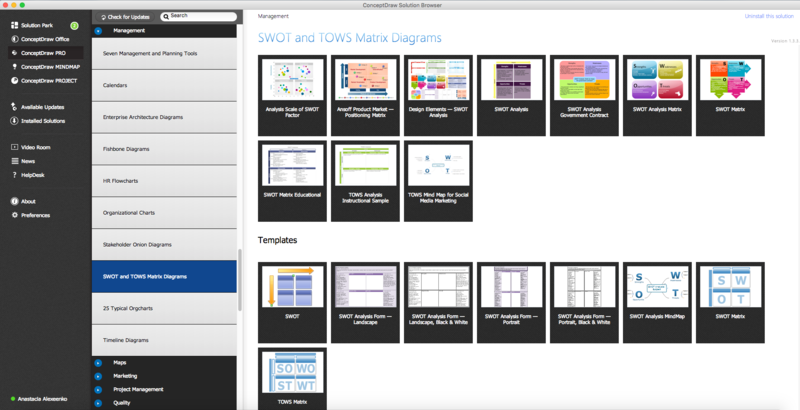 ConceptDraw products and supported by SWOT and TOWS Matrix Diagrams solution forms a great tool for providing SWOT analysis. The solution contains mind map templates. By filling mind map templates, one can easily determine Strengths, Weaknesses, Opportunities, and Threats of the current business. 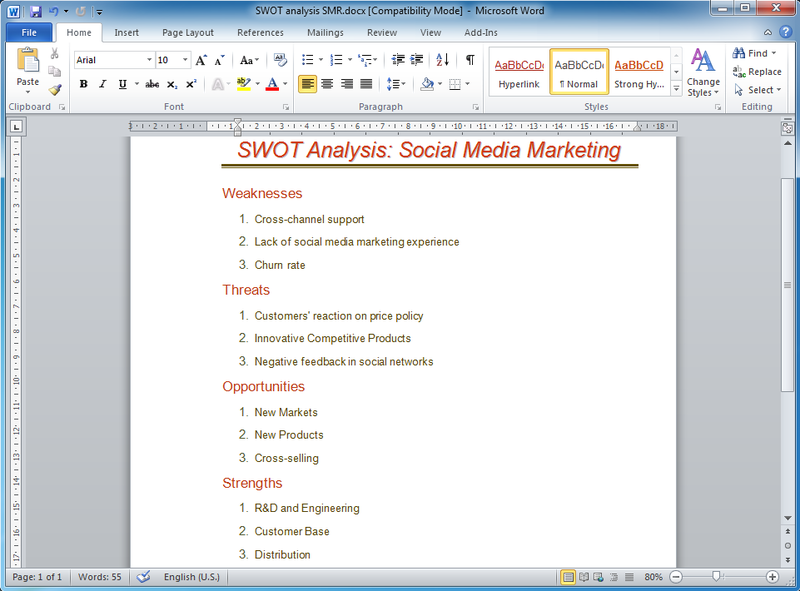 Just a one click is needed to turn the SWOT mind map into a SWOT matrix. The SWOT diagram will be created in ConceptDraw DIAGRAM v12 on the base of SWOT mind map. It is impossible to imagine the biology science without drawings. Drawings are very convenient way to explain the different biological knowledge and processes. If you dream to design any biology drawing quick and easy – the ConceptDraw DIAGRAM v12 software is exactly what you need. ConceptDraw DIAGRAM v12 diagramming and vector drawing software extended with Biology solution from the Science and Education area offers the useful tools for easy biology drawing.